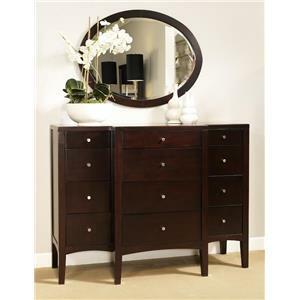 This dresser and mirror set highlights exceptional design and function. Crafted from mahogany and tropical hardwood solids with select Oak veneers, the dresser features six drawers to accommodate all of your bedroom storage needs. Rectangular in size, the landscape mirror features a matching wood frame. 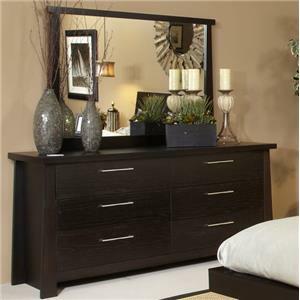 All completed with an ebony finish, this dresser and mirror set is a wonderful addition to your bedroom setting. This nightstand will add a beautiful contemporary highlight to your bedside. 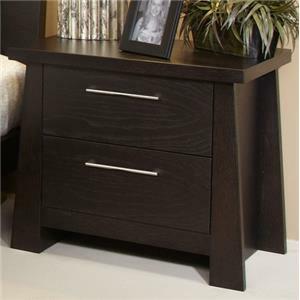 Highlighted by a dark ebony finish, the piece features two drawers for storage and a thick top. Crafted from mahogany and tropical hardwood solids with select Oak veneers, this transitional nightstand is a perfect addition to your modern bedroom. 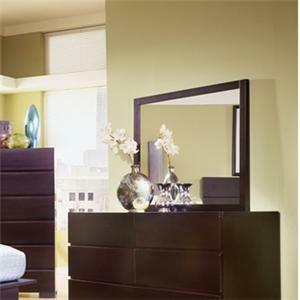 Add style and function to your bedroom with this oval mirror and dresser combination. 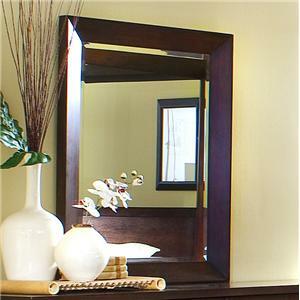 The mirror will add an accent to your bedroom with its dark rose brown rounded frame and exquisite reflective glass. The twelve drawer breakfront dresser boasts fully finished interiors and full extension drawers to offer extra storage space. The dresser features positive stop, which will prevent the drawers from being pulled out completely, making for a safe and sound addition to your home. 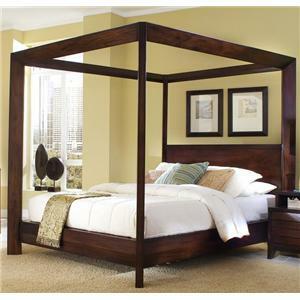 This beautiful low-profile bed showcases low-key, contemporary design. 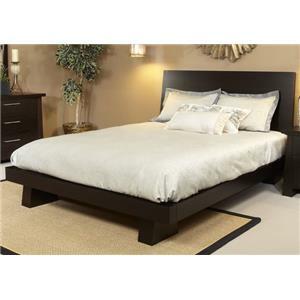 Crafted from mahogany and tropical hardwood solids with select Oak veneers, the bed highlights sleek style accents perfect for the modern bedroom setting. 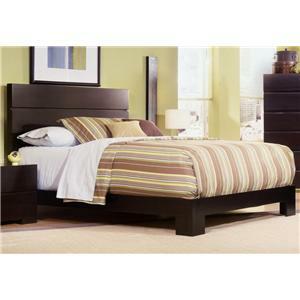 Completed with a dark ebony finish, this piece is a wonderful centerpiece for your bedroom.